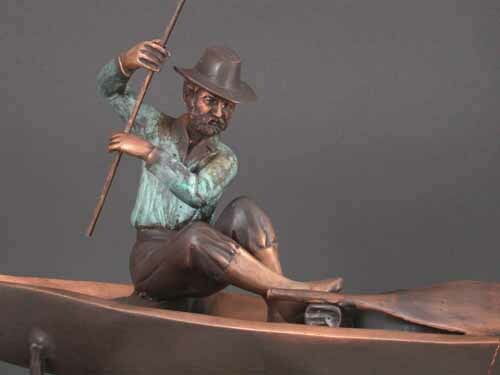 This beautiful bronze fisherman sculpture is approximately 25" long and 42" to the tip of the rod. It measures 23" to the top of his hat and the base is 12" at the widest point. This rare, heavy and solid piece of art weighs approximately 23 pounds. It has a very expensive look and feel, as the casting quality and the antique patina are really exceptional. 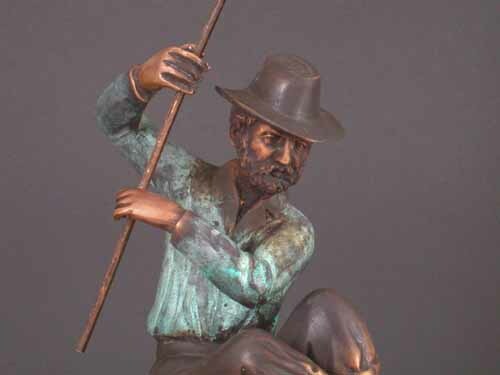 This fisherman, for example, is a solid, heavy bronze statue that peacefully reminds us of the simple things in life. Placed in a living room or office, his presence suggests that we slow down, take a rest, and escape to hear the sounds of silence. It can be used in a water feature, Kio Pond or displayed on dry land, on the floor or a table. The detail work is exceptional and invites close examination. 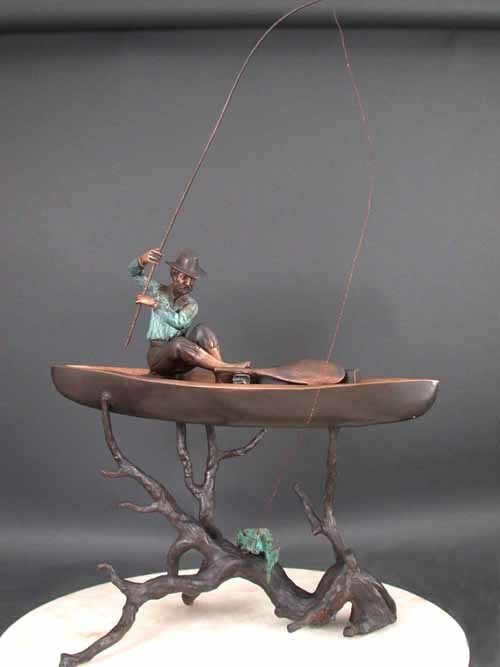 Imagine this beautiful fisherman in your private retreat. Let him bring a calm to wherever you place him in your home or office, and he will gently remind you of what life is really all about. For that, he is worth his weight in gold, as well as bronze! For a Limited time, we are offering FREE SHIPPING (48 States) on this custom UPS oversize box with billing weight of 67 pounds ! It is too large for the eBay's Global Shipping Program so International customers check for UPS or FedEx rates. Don't miss out on this Beautiful Limited Edition Masterpiece! All bronze pieces are cast from a wax model regardless of the original material the model was sculpted. A silicone mold is made from the artist's finished piece, and a hollow wax cast is drawn from this mold. The wax is then repaired, re-worked and finished to the sculptor's specifications. Prior to creating a ceramic shell, vents are attached within the wax model. These vents are necessary in difficult areas where gas may accumulate such as hips, limbs, and neck. The vents allow the gas to escape when the molten bronze is poured and will prevent air pockets from forming and exploding the ceramic shell. The ceramic shell is one of the few materials the can withstand the heat of the molten metal. When the wax cast is hardened and the vents are in place a ceramic shell is formed over the wax. This shell is made by dipping the wax into a slurry, coating it with sand, drying and repeating the process up to 14 times. A core consisting of plaster, ground brick and water is poured into the interior of the wax mold. After the ceramic shell and core have set, the mold is fired in an oven, the wax is melted and the ceramic shell is left intact. This process is known in French as "cire perdue" (lost wax). Molten bronze is now poured into the cavity left by the melted wax. When the bronze is cooled, the shell is chipped away using a hammer and chisel. The bronze must now be repaired and finished. This step is called "chasing" and it is a difficult process because the metal is involved. Any imperfection such as air pockets of pits must be brazed with bronze rod, as in welding. All seams and spurs must be removed by grinding, rasping and, finally, sanding. The next step is to chase or hammer the vents from the mold using special tools. The natural bronze has a dull finish. after final finishing, a patina is applied which may be left matte of polished. Chemicals, pigments, heat, safety equipment and a lot of experience are involved. In addition, since bronze comes in a variety of alloys, the patina requires different chemicals and techniques. 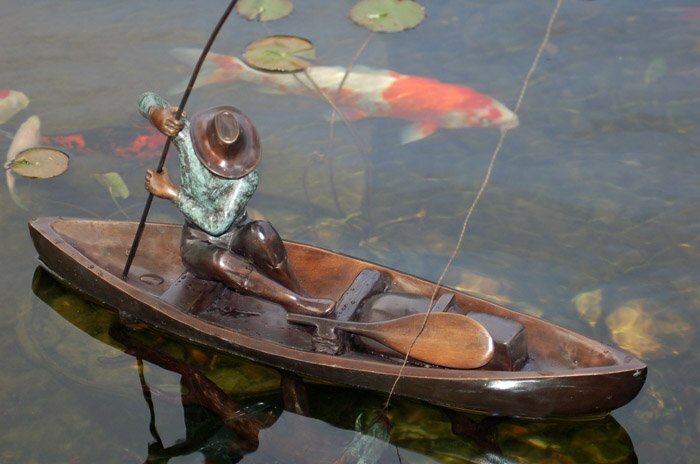 When shopping for bronze art work, beware of terms such as "cold cast" or "bonded bronze." These are misleading names given to plastic figurines. If you are unsure of the authenticity of an item that you see elsewhere, feel free to call us at 1-800-321-8618 for an honest and professional opinion.